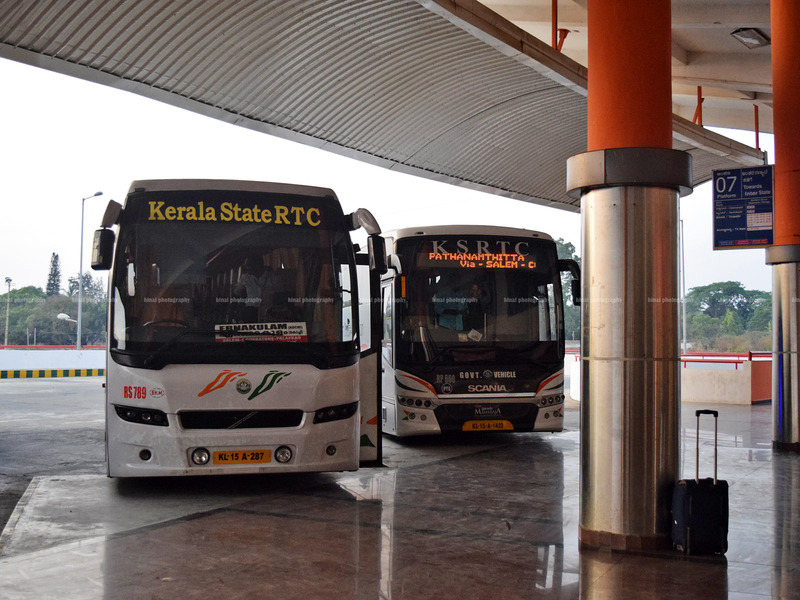 Bangalore to Thrissur: Kerala State RTC Garuda King Class! A big day! Big Reason to travel! I was undecided! I had originally booked on Go Air for a Friday evening - I booked this ticket over two months in advance. Go Air decided to cancel this flight - and, fortunately, they did call me about a week in advance and intimated about the cancellation. The neo troubles were affecting both IndiGo and Go badly. I had planned to rebook on a different airline initially - but some other reasons forced me to hold on for a while. I looked at all the options I had - including the railways! After a lot of procrastination, I decided to bite the bullet, and picked Kerala RTC again - I booked my ticket on the day of my journey. The bus had a little over 50% occupancy at the time - I picked a window seat towards the rear end of the bus, on the left side. It was arts time at office, and I could reach home quite early. After a late lunch, and early evening tea, I set out from home in a fairly tired Ola Prime cab towards Basaveshwara Bus Station near Jalahalli, more commonly known as "Peenya Satellite Bus Station". I was at the bus station by about 1730hrs - well before the scheduled departure time. My bus was being prepped at the parking area - the crew were getting ready for their long ride back home. I moved to the platform area, waiting for the bus to be brought there. 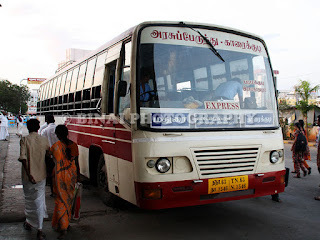 The bus: RS789 being brought to the platform? 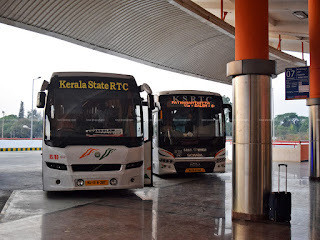 There were a few passengers waiting for the bus at the platform area - first to arrive was a bus to Pathanamthitta, followed by my bus - RS789 of Ernakulam depot. The bus was parked at the platform, and the crew went to get the reservation chart. Majority of the passengers got into the other bus - there were all of three people (including me) in this bus. 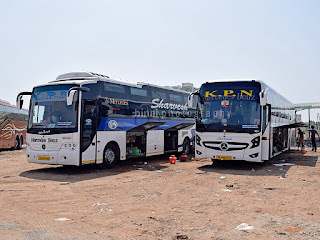 The crew of my bus were waiting for the Pathanamthitta bus to leave, since that bus had a earlier departure time from Mysore road bus station. We finally got moving at 1833hrs - about 18 minutes behind the scheduled departure time. 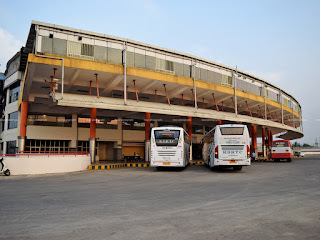 Since we did not have pick-up at Mathikere, the bus could take the shorter and direct route to Mysore Road Satellite bus station (through outer ring road). There was traffic right from the beginning - we crawled slowly through outer ring road. Traffic eased a bit after Sumanahalli - we maintained rolling pace till Nayandahalli. We made it to the satellite bus station on Mysore Road at 1928hrs - 32 minutes before our scheduled departure time. The Pathanamthitta bus, which had left well before us, hadn't reached there yet!! I spent some time chatting with my acquaintances there - and returned to the bus only a while before departure. The bus departed perfectly on time (2000hrs) from the bus station. The reservation chart showed we had 34 reserved passengers (Maximum 48) - very healthy load for a weekday during the weak season. The large bus station for the very few departure.. The bus was not in great shape - the rear suspension had taken a bad hit and rattled very loudly. The overall maintenance of the bus wasn't great - not the usual condition of Ernakulam's Volvos (they have just two of them). 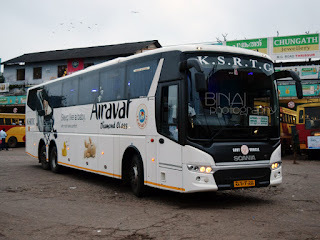 This bus was with Trivandrum depot earlier - and was transferred to Ernakulam only about a month ago. The driver was quite fast - he maintained pace wherever he could. It was a routine working day in Bengaluru, and traffic was at its peak - we made it to Shantinagar bus station by 2030hrs. Boarding took a while - the crew had to call up a few of them. We finally got moving by 2036hrs - back to the maddening traffic of Bengaluru. Quite unusually (compared to my previous trips) a movie was played this time. Our next pick-up was at Christ College, near Dairy Circle - four passengers joined here - and we continued our journey (2048hrs). We made it to St. John's Hospital bus stop by 2052hrs - boarding was slow here too - we got moving by 2058hrs. We got into terrible traffic - the vehicle moved inch-by-inch - all the traffic signals were chocked. Madiwala market was a bigger mess. We picked pace once we exited the market road. We had more pick-ups today - we stopped at Bommanahalli (2132hrs) for more passengers. The last pick-up for the trip was at Electronic City - this was a fairly long halt, and we got moving at 2151hrs - over three hours to exit the city! The driver picked pace once were passed Bommasandra - letting lose the 340 horses he had at his disposal. Ready to depart from Platform7! We passed Attibele toll gate by 2208hrs, and Hosur by 2219hrs. The driver maintained healthy pace once past Hosur - there was minimal honking, and fairly stable driving. I was quite hungry, and was badly looking forward for the dinner break - we made it to Hotel Saravana Bhavan Classic by around 2252hrs - the parking was packed - I was expecting the restaurant to be packed as well. I could find a seat fast - had a quick and light dinner before returning to the bus. The crew were quick as well. We managed to depart from there by 2319hrs - a quick 27 minute break. The conductor did a quick ID card check as we departed. I had a nice long sleep after dinner - I vaguely remember waking up as the lights were turned on for ticket checking. Interestingly, they did not wake up passengers for checking, but did a head count instead. I think the bus also took a tea break en route - not very sure, but I vaguely remember the bus stopped on the road side. I remember seeing Pampampallam toll gate (just past Walayar, the TN-Kerala border). I woke up just as the bus turned off the highway towards Palakkad bus station - we reached there by 0429hrs - passengers quickly deboarded, few new passengers joined and we got moving by 0434hrs. I managed to get some more sleep and woke up just as the bus entered Thrissur town. I gathered my belongings and got off my seat as the bus turned towards the bus station from East Fort. 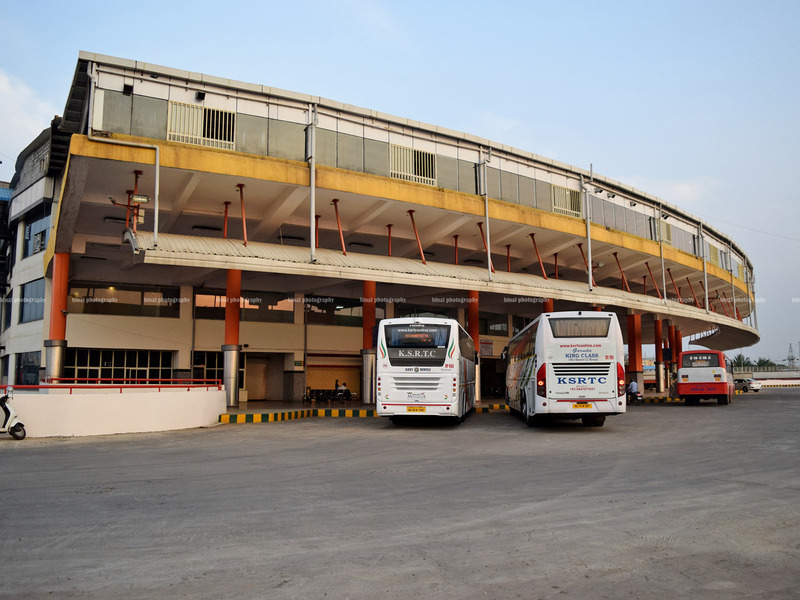 I got off the bus at Sakthan Thampuran Nagar Bus station - the main hub for suburban buses - at 0544hrs - behind schedule, but the usual arrival time based on my experience. 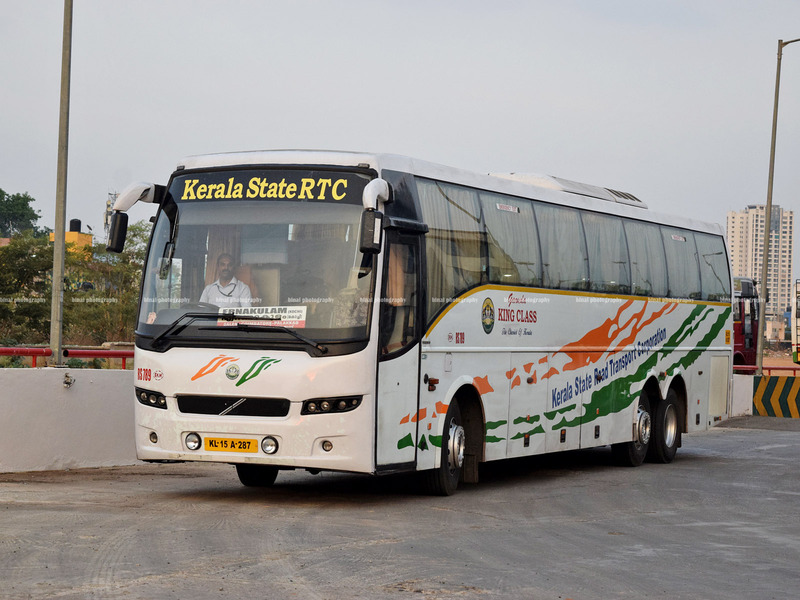 Remarks: The bus, RS789 (KL-15-A-287) homed at Errnakulam depot (formerly at Trivandrum depot) had clocked a little over 9.03 lakh kilometres. Arrival at Thrissur was on the dot - 0544hrs. This service arrives Thrissur always arrives around the same time. The crew were great - a very soft spoken conductor who handled passengers really well. The driver was efficient - picked pace soon, maintained pace really well. Absolutely no honks after dinner - minimal honks before that. I do not recall any hard brakes. Maintenance of the bus was quite bad - the bus was clean, but the earlier depot seemed not to care about the suspension at all. The bus rattled badly at every bad patch of road. Seats were in good shape, and the bus had the original cream coloured curtains. The end-to-end journey took about 11 hours and 49 minutes, while the running time from Madiwala was 8h46m, including the 27 minute dinner break and entry to Palakkad town. 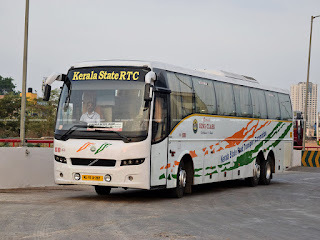 Another good journey with Kerala RTC. Will I take this service again? Absolutely. Already my preferred service on the route. I have 2 more pending flights with Go Air; in June and September. Hope they won't get cancelled. Last month's got cancelled and I didn't even have a clue about that even 4 days before the trip. You had tipped me about the cancellation in the comments section of one of your previous posts. I had raised the matter with their appellate authority then and advised them to at least inform pax in advance. That way Spice and Indigo are good. They intimate confirmed pax of any changes well in advance. Good to know that KeSRTC is getting decent loads on weekdays. I hope you will always remember this journey and the bus details as this carried you home for your engagement! Congrats & wish you all the best on your engagement!